Would it be appropriate/useful to anoint your own hands with Healing Oil if you are not the one who needs the healing but are looking to provide healing through therapeutic touch such as massage or Reiki? Essentially, can you use the oil to impart healing properties to your hands for the benefit of others? I love love love LM's healing oil. Recently, I burned a plain white vigil candle (what I had on hand) that I dressed myself with the healing oil. I was needing a healing after breaking up with my boyfriend. I've started paying more attention to "signs" for 3 days after doing work. Sometimes the big results take time to manifest, but if I get a sign in a couple days, then I know I have something to look forward to. I was home one night watching television (vigil candle burning) and thinking, "This is crazy. How can you just expect to be spontaneously healed from heartbreak? Can asking for that even work?" LOL...Right then, a television commercial came on loudly (as they always do) that announced, "HEALD!" (The name of a local technical college.) Then people on the commercial kept saying, "I'm a Heald graduate!" "I went to Heald." It was cracking me up! And yes...my broken heart is on the mend quite nicely. Record time. I must be "HEALED!" I searched the forum and did not find a topic specific to this or a spell specific to this on the entire site. Does anyone know a good healing spell that I can use with a white and/or blue candle dressed with Healing oil? And if there was a discussion of this previously that I may have overlooked could you please post the link. Thank you, for your quick response, however all I could find was a spell used with blessing oil under the healing spell link, does anyone think I could just modify it with healing oil instead? I am looking to heal emotional pain not physical. the spell using blessing oil was to heal emotional pain and depression. you could use both oils together, though I assume the question is I have healing oil can I use this in the same spell asa substitute to get over emotional pain. 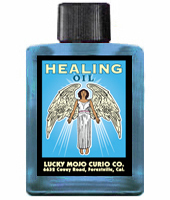 according to the LM website http://www.luckymojo.com/oil-healing.html it is used for emotional and physical pain so id say go for it. I have had a rather rough year: my youngest brother died unexpectedly earlier this year, my husband left 3ish months ago and now I have a customer at work making life rather difficult. I have other workings going to deal with Absent Husband and Obnoxious Customer, but I feel that personally, I am in need of some healing. I plan to dress and light a white candle with Healing Oil for myself (and other members of my family as well) but was wondering if anybody had other suggestions? I also recently bought Clarity for another purpose, but are these two products anything any of you would combine? Blessings and peace to you in the new year. Thank you so much Aura, this is the second question you've answered for me today. And possibly more important, this is exactly what I needed. Hello everyone! I have been so grateful to come across this site because it is helping me have a new perspective on the world and different energies we work with on a daily basis which I love. I am already doing some love work on my ex which seems to have much promise, a lot of work ahead for me but definitely hope, from the last reading I received. A second chance with him is possible. Which is part of the reason I'm now posting; I want to know of any oils or spell work that I can do on myself to help me heal and become more self confident and give me the focus to achieve my goals and dreams instead of giving up and becoming lazy when I'm not even half way through. I need courage to complete things I set out for myself as well as the drive to achieve them. I saw healing oil and am curious how I can use this on myself, possibly with crucible of courage? I have endured a lot throughout my life such as sexual abuse, eating disorders, deaths of loved ones, past drug use and what comes with that use and all of this has just had an overall effect of making me feel worthless and not good enough in relationships. That I take a passive role in a relationship and am afraid to let myself shine cause I feel inferior. Especially since because of the sexual abuse and rapes and the eating disorders that developed strongly before and after these events I never finished high school and was unable to graduate. My ex is so smart and intelligent, I always felt I wasn't as smart and would be scared to partake in certain conversations cause I had no background knowledge from my lack of an education. I know I'm not dumb, I have knowledge in other areas and passion but I lack the ability to finish things through. As I am working on getting my ex whom I love with all my heart and whom I know still cares for me a great deal and loves me... I do know for a fact that I need to really work on myself as well to help me heal from these past events and current issues I am having with myself since they played apart in our break up. I want this as much for myself as I do for him, I want him to also see that I will not be the same person he wanted to leave but that I am someone who can truly be a life partner and hold that title. I currently am in counseling for my eating disorder I've had for over 10 years and am receiving help with that but I would love to gain more knowledge on how to use this oil and any others that may be suggested for that extra boost. So please, if anyone may be kind enough to suggest how I may work with this oil and possibly other oils that I have not mentioned but that would be helpful for my situation will be more than welcomed. I want my inner light to shine through and be the person I know I can be and to not be blocked by the darkness of my past and be afraid of letting myself be seen. I want to be truly confident, focused, driven and to truly love myself and not doubt. And if this isn't quite the thread to post all of this I apologize, it was a little hard to find the self love page and I did want to learn about this oil as well! So I figured one post would be better. Thank you! You have really lived such a challenging life. I think that you're an absolutely AMAZING person for having endured what you have and still survived. Not too many people can do that. 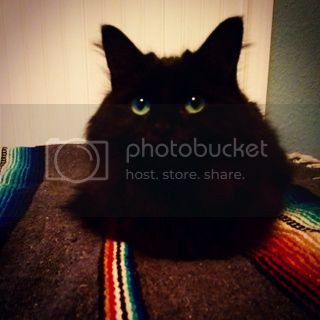 Your post is well-written; grammatically correct, passionate, and poignant. You are an incredibly intelligent person. So, yes, it's true that you're self-esteem is low based on the fact that you're an incredibly strong and intelligent person (but believe otherwise). So very happy that you're receiving counseling. You're definitely on the right track and I commend you for that. And, you're absolutely correct about the Healing products and the Crucible of courage products. They are perfect for your concerns. I would also encourage you to go to our search engine (upper right hand corner, there's a white search box in the dark green area) and type in the words: self love. You will find lots of very helpful information for your query. Thank you so much for the reply Ms. Aida! Your words are very kind and I truly appreciate that, it feels good to hear those things I will definitely be searching self love in the forum and see what I find. I'm so ready to feel that way about myself, it's definitely time. I will also definitely keep in touch if I need any more help. Thank you again! Have a blessed day! This oil is wonderful. I just had some great success with it. The back story is that I've been feeling really negative & hateful toward my husband & his mistress, just really resentful that my divorce is taking so long & angry with her for making things even more difficult between he & I. She did end up moving out of our house (now his) when I did some Reversing work, but then she ended up back at the old man's house (that she lives off of, like a parasite), & the poor old man hurt himself & had to convalesce for a couple months in a nursing home. So while the old man definitely doesn't my husband at his house, this woman has been having him there carte blanche & just basically her & my husband ended up with two houses! So not fair, especially because me & the kids are in a small two bedroom apartment. I tried talking to the old man, but he thinks she's his g/f & of course didn't want to accept that this was going. It really didn't do anything but prompt her to use my husband's phone to harass me via text & calling. So...instead of keeping on the low road, I was inspired to anoint a blue candle w/ Healing & Blessing oils, bless it with the appropriate psalms & pray my heart out that God heal this man & bless him to be home with his family by Thanksgiving. Well, I think I've learned that God loves it when we bless others now! This man is going to be home for Thanksgiving! Yes, yes, yes!!! I just want to say that you can take the high road AND feel the satisfaction of seeing your enemy's plans defeated if you do it right. In addition to proper medical care which is a priority, Healing oil is a great choice Moonlightdream. Combining it with 7-11 Holy Oil is one nice combination, Tranquility is another alternative - particularly if the illness is causing anxiety and mental turmoil. If you work with Saints, then Dr Gregorio Hernandez products are excellent, particularly if they need guidance toward the best health professionals for their situation. Blessings to you and your family through this difficult time. Oh that is a wonderful suggestion Aura! Thank you so much! Would definitely post a prayer for my parents. I just ordered the healing oil, blessing oil and protection oil too =) I hope the combination will be effective. I have a blue candle and healing oil and clarity oil. Can I crave healing my friend eye problem and rub the candle on top? He want me to heal his eye problem. He has problem of seeing. You can definitely use a blue candle with healing oil to work candle magic to heal your friends eye. Clarity I guess would not hurt either but I think that is more for Clarity of thought or knowing the truth of situations. IT might be a nice touch though. I am not sure what you mean by rubbing the candle on top. Are you working with a vigil candle? If so you can rub a little oil on the top. Most folks I know poke holes into the wax and drip a little oil in the holes. I've been preforming breakup work on my love interest whose been in a on off relationship with his ex whose just down the road from him .He want's to make love to me and visit me, but he's very depressed due to his children having ago at him and his brother has bowl cancer and hes working from 6 am to 6 pm so has no time for himself , so his Mum is telling him to basically get a grip because he's a grown man.He desperately needs healing and I want to help him. But would this affect the breakup work I am preforming on him and the ex ? Would healing be a good idea ? The healing work is separate from the break up work, unless you were specifically trying to heal his relationship. One doesn't have much to do with the other. I agree with AlyssaH !!! Thank you very much AlyssaH and Miss Aida , I appreciate your help. Hi, I believe my difficult situation calls for forgiveness work as the first step. I'm pretty sure missionary church does not have forgiveness vigil and I was wondering what other oils or vigils I could combine with healing to help my target forgive me for something. I was thinking clarity and tranquility ..but is there anything else? Thank you! Reconciliation products have healing properties for a relationship as well as the others you mentioned. While searching the forums I've found that both Healing and ROC oils are used for depression type situations. What are the differences between the two? Is it basically that Healing helps with mental and physical, while ROC helps with mental (depression) and fear? Are there other uses that differentiate them? Hmm, so Rose of Crucifixion is more for nagging mental thoughts and fears? I'm imagining it being used for problems with over analyzing things, circle thinking, focusing on events or things said that really bothered the person, everything that could go wrong in a situation, etc. So when people use it for depression, it might be for depression related to those thoughts and fears taking over? Would that be correct? I'll go with Healing for now because it sounds useful in many situations that might pop up in life. It gives me the impression of being very gentle, soothing, and comforting. Thank you again Miss Aida. You're right on all counts. But, why not go for both? Just wanted to comment that I had an interesting experience with the healing oil today. I drank a lot too much last night, and woke up this morning vomiting every 15-20 minutes, and none of the usual remedies were helping. After about two hours of this, I remembered that i got my first LM order yesterday, and one of the items was the healing oil...I know this is intended for spiritual healing, but I figured it couldn't hurt to give it a try, so I opened it and rubbed a bit on my stomach and in the area of my liver. I was able to go back to sleep after about 30 minutes and haven't vomited again. When I got up and started moving around, I was still feeling pretty bad. I decided to go ahead and start the healing work I had planned for someone. I used blockbuster powder (which smells divine! ), and healing oil on the candle, and since putting the oil on the candle I swear I feel better. By the way, I can't get over how BEAUTIFUL this oil is!! I love the herbs and seeds and grass in the jar, and the jar itself. It is the only oil I've gotten so far - my first order was mostly powders. Can't wait for my next order, which is the 12-oil special. If anyone is trying to decide whether or not they are worth it, they are worth it for the aesthetic value alone in my opinion. Like a tiny little work of art. I have yet to order Healing oil...could I use Sun oil instead til I order Healing oil? LA1985 -- Healing Oil is not the same as Sun Oil, but both promote overall well-being. Can I use Healing oil for anxiety? OCD? Intrusive thoughts? I was thinking about Tranquility as well, but I really want to be healed. I'm just now learning that its common for child abuse, in my case, physical and mental, to be a major risk factor, and I'm seeing now how that really affected me, and now i'm just seeing the abuse period. I'll use the Healing Oil for that as well. What's really debilitating, and I believe you understand, is that there are intrusive thoughts that can throw you into mental hell because you know the power of intention. Especially when you're doing spell work, and your mind goes, "it's really for this other situation that you absolutely do not want to think about." It's a hallmark of this disease that even though I may know it's not at all rational or not the power of intention, that I really just can't kick the thought out of my head. I just really need a clear head so I can focus on what I want in my life, and so I can concentrate on my spell work, without any interruptions. Thank you and thank you for understanding. I just wanted to add that I hope you're seeing professional psychiatric/medical help for your anxiety, OCD and intrusive thoughts, especially since it sounds like they're really impacting your life. Hoodoo can be a nice addition to therapy and medication, and that three-pronged approach will serve you much better than rootwork alone. I don't have any insurance for those high costs And there aren't any OCD specialized psychiatrists in my town. I'd have to travel quite a bit, but I don't have a car right now. But if I ever could, I would. Thank you, I do need to do that as well. I'd never thought to go get psychiatric help, since I was told some years ago that I wasn't, "that bad/severe of a case." But I think it has advanced much more since then (8 years ago). If I wanted to use Healing oil for whatever child abuse I have suffered, how would I go about doing that? Maybe baths? Please red the posts on this thread. I want to know if I can use Healing oil on a 12 inch white candle, with an anoited petition under. It’s for a dog I saw on You Tube and Facebook that was mangled by pit bulls. I have been praying and the candle is going. Praying for a miracle recovery for this poor dog that he doesn’t lose his leg. What else can I do? I have prayed to Jesus and St.Jude. I have had this oil for awhile now, never used it till now. I think that's a lovely, simple working, and I think you're very kind to want to help this dog. You could also pray to St. Francis of Assisi to watch over the dog. I love the smell of the LM healing oil. I only used it once for a client on a white skull candle. I want to use it on myself because I have health issues particularly with my breathing. What day should a healing spell be done, and what are some good herbs for healing? I am glad you like our Healing Oil. t is one of my favourites to make, as a matter of fact, because i too like the fragrance. Depending on what is being healed, you could chose a day based on the ruling planet of the zodiac sign of the body part. For instance, for a hurt foot: The foot is the provenance of Pisces and Pisces is ruled by Jupiter, and Jupiter's day is Thursday. To find healing herbs, go to this page and search for "healing"
Or buy a copy of my book "Hoodoo Herb and Root Magic," which contains a full page list of healing herbs, with hundreds of spells you can find just by going to the entries for the herbs, which are alphabetically listed. Yes you can, go to the churches site, order the candle, you can upload a photo of you, and a petition explaining what you want healed.